To document that teaching was actually happening, Musgrave and her colleagues used video to capture examples of wild chimpanzee mothers transferring specialized termite-gathering tools to less-skilled, immature chimpanzees. These transfers, which are costly to tool donors but beneficial to tool recipients, meet the scientific criteria for teaching in wild apes. We're also told, "In this study, chimpanzee mothers both anticipated the youngsters' need for a tool and devised strategies to reduce the effort necessary to provide them. Chimpanzees and many other nonhuman animals (animals) are quite adept at making and using various sorts of tools (scholarly essays can be found here). However, while there are data that show that individuals learn to make and to use tools by watching others do so, and many researchers have suggested that older individuals actually teach youngsters to make and use tools, compelling data haven't been collected for wild chimpanzees. Research has shown that New Caledonian crows, who are renowned for their ability to make and use complex tools, teach youngsters to make tools in what are called "tool schools" (please see "Crows and tools: Calling someone a birdbrain can be a compliment" and "Clever New Caledonian crows go to parents' tool school"). These crows are renowned for making the most complex tools in the animal kingdom except for humans. Transferring termite-fishing probes is actually teaching because "they occur in a learner’s presence, are costly to the teacher, and improve the learner’s performance." Teaching is a form of high-fidelity social learning that promotes human cumulative culture. Although recently documented in several nonhuman animals, teaching is rare among primates. In this study, we show that wild chimpanzees (Pan troglodytes troglodytes) in the Goualougo Triangle teach tool skills by providing learners with termite fishing probes.Tool donors experienced significant reductions in tool use and feeding, while tool recipients significantly increased their tool use and feeding after tool transfers. These transfers meet functional criteria for teaching: they occur in a learner’s presence, are costly to the teacher, and improve the learner’s performance. Donors also showed sophisticated cognitive strategies that effectively buffered them against potential costs. Teaching is predicted when less costly learning mechanisms are insufficient. Given that these chimpanzees manufacture sophisticated, brush-tipped fishing probes from specific raw materials, teaching in this population may relate to the complexity of these termite-gathering tasks. A popular account of the groundbreaking study called "Wild chimpanzee mothers teach young to use tools" summarizes this discovery (other media accounts can be seen here). Here we read: "The first documented evidence of wild chimpanzee mothers teaching their offspring to use tools has been captured by video cameras set to record chimpanzee tool-using activity at termite mounds in the Nouabalé-Ndoki National Park in the Republic of Congo, according to new research from anthropologists." To document that teaching was actually happening, Musgrave and her colleagues "used video to capture examples of wild chimpanzee mothers transferring specialized termite-gathering tools to less-skilled, immature chimpanzees. These transfers, which are costly to tool donors but beneficial to tool recipients, meet the scientific criteria for teaching in wild apes. We're also told, "In this study, chimpanzee mothers both anticipated the youngsters' need for a tool and devised strategies to reduce the effort necessary to provide them." This is a very exciting discovery and I look forward to more comparative studies to learn about the distribution of actual teaching among other animals. 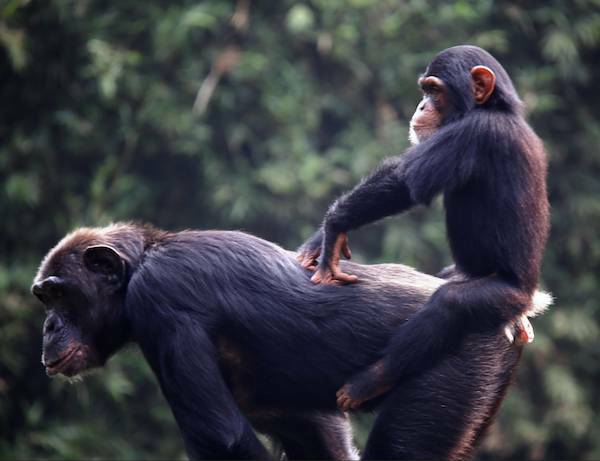 Researchers apply strict criteria for calling an activity "teaching," and this study of wild chimpanzees fulfills them.